Last week I shared that I’m finally getting the backyard landscaped (you can see the before pictures here). It’s been a long time coming, so every bit of progress has been exciting. Let’s get right into it! Day 1 – The workers mostly just cut down the weeds and worked in the pool area. The removed all of the random river rocks and leveled out the remaining dirt. 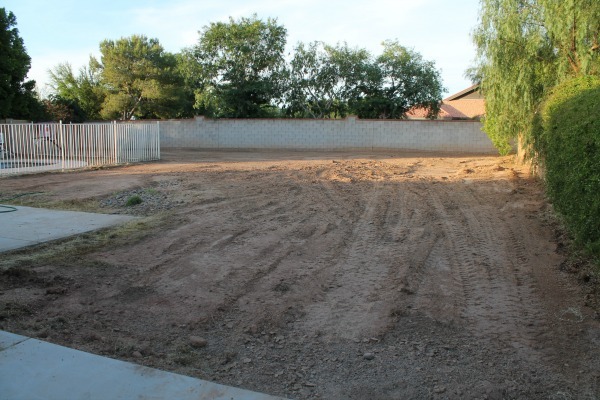 Day 2 – They brought in a tractor and leveled out the rest of the yard. Can you believe this pile of excess dirt?!? Day 3 – All of that excess dirt was hauled away. If you look at the back fence, you can see the dirt line that shows how high the yard used to be. I still can’t believe how much dirt they had to remove! Day 4 – The trench for the drip line was dug around the perimeter of the yard and out to the front water main. They also marked the location of the paver patio and trees. It’s kind of hard to see in the picture so I added text to help illustrate where everything will be planted. 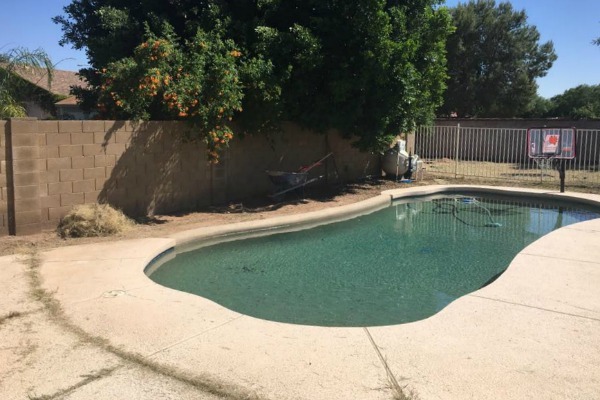 I decided to add more plants to my original plan/quote, so the yard will have 2 additional shade trees and the pool area will have lots of colorful bushes and flowers. I can’t wait! More work is going on today, so I’ll be back next week with more updates! Hopefully everything will be done in time for a full reveal the following week! Now whatchu got there is one big pile of dirt. I hope you played a little Queen of the Mountain? Dude, I am so stoked to see what you do. Fer reals. I think it will be totes amaze. I've decided to regrass one section of my yard because I am inspired by yours! It is gonna look so good! Can't wait to see the final results!